Smith Tavern is a 1770 Colonial With Exquisite Interior Details. This former tavern retains a lot of colonial-era charm and is a beautiful and peaceful place to stay. It remains a great home to entertain guests or to be by yourself to enjoy the solitude of the surrounding countryside. The original (dating to 1770) portion of the house was completely refurbished in the Fall of 2018 with new insulation, brand new windows, and central air in the upstairs bedrooms. There is a Master Bedroom suite in the upstairs or the original portion of the house consisting of the Master bedroom with its own fireplace and a trundle bed (two twin beds) in an alcove, a bathroom, a second bedroom with a queen size bed. The living space consists of a formal living room with a fireplace, a TV area with its own fireplace, a dining room with beautiful wood panelled walls and wide plank flooring and a fireplace, and a kitchen with an eat in dining area. There is an authentic New England colonial feeling as little has been changed in the main living space (wood beams, fireplaces, etc). Adjacent to the kitchen is a newer bedroom wing consisting of a master bedroom and bath, and two smaller single bedroom, each with private bath. There is also a powder room off the main entrance hallway. Each bedroom has its own air conditioner. The house has two decks, one on the eastern portion of the house overlooking a private pond, and a more secluded and larger deck on the western side of the house that features gorgeous sunset views over a hayfield ridge. Smith Tavern is approximately 2900 square feet. The house is located in the middle of a 700-acre estate which features two private lakes (one better for boating, one better for swimming). There are miles of hiking trails located in quiet forest. There is also a working farm which produces Grassfed Beef as well as naturally raised pork and poultry. For an added fee, guests can arrange some time working on the farm (contact us for details). The house is also near the well-known Litchfield Daffodils, a twelve-acre planting of narcissus which bloom each Spring and attract admirers from near and far. We will be installing a plunge pool in April of 2019. The pool is small (7' x 13') but big enough to cool off in the summer, and will be heated so as to extend the swimming season from May through September. Oil fired hot water baseboard - for winter rentals, there is extra charge for heating if guests will rent for long periods of time. 1 kayak and 1 canoe and 1 pedal boat available for rent at private lake. The plunge pool is heated and will extend the swimming season from May through September. Private Lake with swimming beach across the road. There is a second private lake with boats a ten minute walk down the road or through some very pretty fields. There are also miles of private hiking trails. We rented this house for a week Mon-Mon for my son's wedding. For most of the week it was just my husband and me but from Thursday night through Sunday morning, we were joined by my son's friends that were standing up for him on his wedding day. The house was perfect for his friends to hang out between wedding activities and I enjoyed getting to know them. We mostly used the kitchen at breakfast and lunch and it was great to be able to have food on hand for whenever we needed it. Since the house had so many bedrooms and bathrooms, everyone was able to have their own space to get ready for all the weekend activities. The house is a beautiful historic house that has been obviously had updates. The only glitch we had was that the microwave would kick the circuit breaker but the box was very close and just had to be quickly reset. The weather was still cold so we didn't have a chance to explore the property at all but I think in a few more weeks the area would be beautiful. We did enjoy seeing the rabbits that our neighbor put out in pens during the day. I heard dogs barking at night but I don't think that it bothered anyone else in our party. Having a full week rental was great because we had a day after everyone left to get everything cleaned up and spend a little quiet time with the young couple and the other parents before everyone headed back to their homes (and the kids on their honeymoon). John was a great host and quickly took care of any issues that we had. This property was out of a movie. The house and surrounding grounds were amazing. The home was clean and had everything we needed. Allegra was a joy to work with. We can't wait to have another Family trip at Smith Tavern. Thank you! Beautiful, comfortable home in wonderful location. We held a cousin's reunion at Smith tavern, six women who grew up together spent the weekend. This house was cozy, clean, comfortable and a perfect place to gather and visit. We sat on all three decks, played board games in the dining room, and had long, late night visits in the lovely parlor. Each bedroom, even those not pictured were clean, pretty and very comfortable. The kitchen was more than sufficient. Working with John through the rental was a pleasure and his son, Dan, who greeted us, was very gracious. If I am ever in the lovely Litchfield area again this is where I would stay. Very nice house and beautiful setting. We enjoyed our three night stay in July very much. We had two families with teenage children, 9 total. The house is larger than it may appear and is a true former tavern but nicely decorated and equipped. 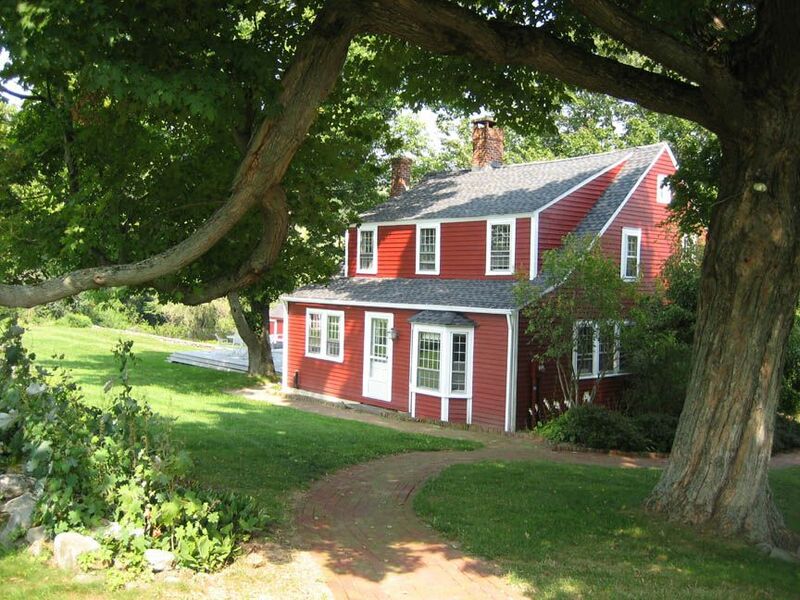 This is a beautiful part of Connecticut with rolling hills and the house has a nice open view of pastures and sunsets. We would like to go back again. Wide plank floors and comfortable furnishings in a beautiful setting make Smith Tavern a perfect retreat vacation location . The large living room, kitchen and deck with grill are nicely appointed and encourage socializing. The bedrooms comfortable and cozy. John, the owner, who sells high quality grass fed beef from his windmill down the road on Sundays, lives next door and was friendly and attentive to our needs. We were renting Skybarn and Smith Tavern from John for our 42nd college reunion so meals and socializing took place at Skybarn with Smith Tavern used primarily as sleeping quarters. Those staying at Smith Tavern gathered on the deck with coffee each morning to enjoy the beauty and peaceful calm of the Litchfield hills, with the added charm of cattle in a nearby field. Blessed with perfect warm days and cool nights, we really enjoyed our stay at Smith Tavern.